Kitchens are the heart of the home. They are the places where a family sits down together for a meal, where children do their homework and where friends and relatives gather at holidays and celebrations. 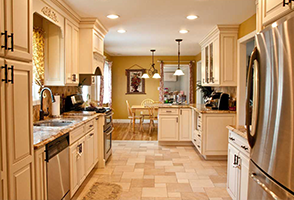 Gary Courtier Home Improvements is one of the few Long Island construction companies to have a dedicated, in-house kitchen designer. We have the ability to work with our clients through every aspect of kitchen construction, from concept through installation, insuring a smooth experience and fantastic results. And, at Gary Courtier Home Improvements, there are no surprises. The price we give you is the price you pay. Turn your kitchen into the warm heart of your home you've always dreamed of! Contact us today for a free estimate and design consultation. Sign up for our mailing list for the latest news in home improvements! All site content copyright © 2013 Gary Courtier Home Improvement | All rights reserved.